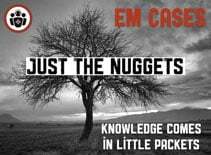 This is EM Cases Episode 105 Commonly Missed Ankle Injuries. You probably can’t remember the last time you worked a shift in the ED and didn’t see at least one patient with an ankle injury. 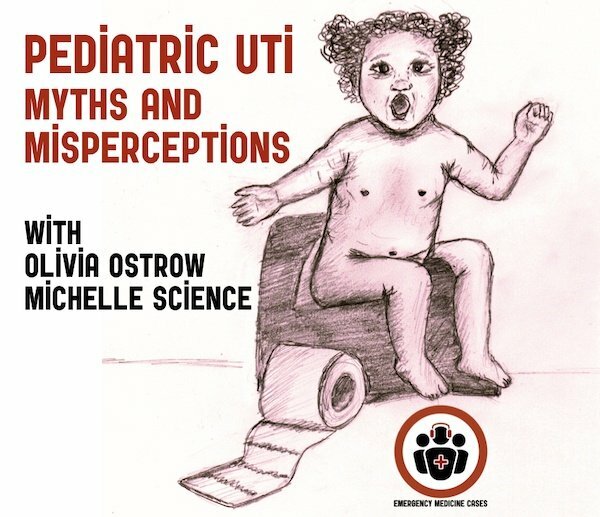 While almost all of these patients are relatively straightforward to diagnose and manage a small but significant minority of these patients will have a more elusive diagnosis, that if not identified early, could lead to significant morbidity. On the flip side, if we’re super conservative and defensive and we immobilize everyone with an ankle injury no matter how minor we’re not doing our patients or our consultants any favors either. 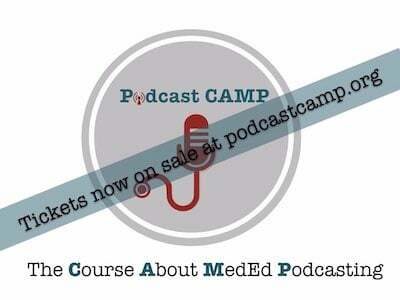 Cite this podcast as: Helman, A, Sayal, A, Mehdian, H. Commonly Missed Ankle Injuries. 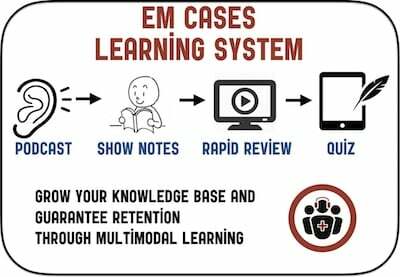 Emergency Medicine Cases. 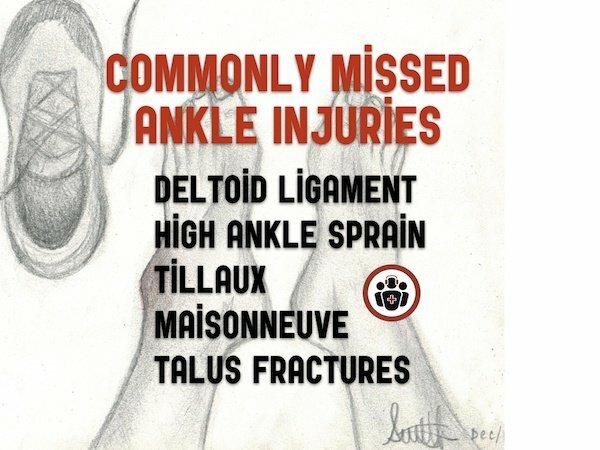 January, 2018. https://emergencymedicinecases.com/commonly-missed-ankle-injuries/. 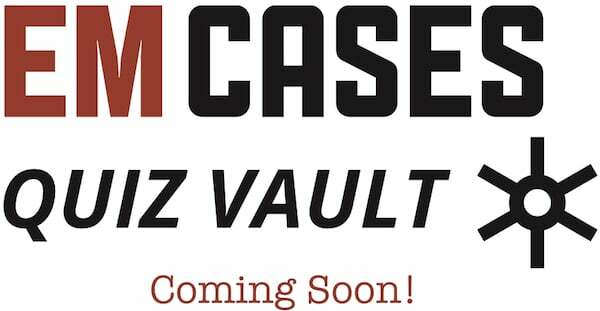 Accessed [date]. Don’t short change the history and physical for ankle injuries! We would not short change a patient with chest pain by taking a poor history. The same should apply to ankle injuries. It is best that we see and examine our patients first and then look for pathology on the x-ray, rather than the other way round, as often happens on busy shifts. Here are some useful pearls for the H&P to help distinguish the simple lateral ankle sprain or fracture from a more sinister injury. The key here is mechanism, mechanism, mechanism. What was the direction of force applied? What was the height of the fall? What was the direction the foot turned? What happened afterward (i.e. weight bearing status)? The patient reports an external rotation mechanism – consider this the “thunderclap headache” or “chest pain radiating to the back” of the ankle. The patient is not weight bearing at all. Don’t forget the PMHx here. Has the ankle been injured before? What is the functional status of the unaffected limb? Are there any sensory deficits from diabetes, recent back surgery or chronic alcoholism? External rotation mechanism of ankle injuries should be considered a red flag as the “thunderclap” headache is for subarachnoid hemorrhage. Do not limit your assessment to where the Ottawa Ankle rules guide you. Pitfall: Using the Ottawa Ankle Rules to guide your physical exam of a patient with an ankle injury. Remember the ankle exam starts at the knee. Work your way down the entire fibula looking for tenderness. However, don’t be satisfied that the absence of tenderness there rules a Maisonneuve or Dupuytren’s fracture. Pearl: Ischemia as a result of an isolated ankle fracture is very rare. If you find signs of ischemia in the foot, examine proximally to assess for additional injuries. 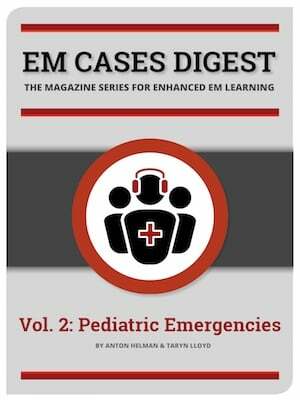 The commonly cited Weber classification system is cumbersome and impractical for ED use. 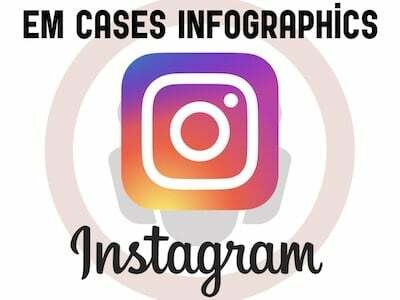 In the Closed Ring Classification System the ankle is thought of as a ring of bone and ligaments surrounding the talus consisting of the tibia, the medial malleolus and medial deltoid ligaments, the fibula and lateral ligaments and calcaneus. A single disruption in the ring allows stability to be preserved. Two disruptions portends instability and will likely cause the joint to shift. Lateral malleolus fracture even with no medial injury may become unstable. There are many great resources that help walk you through good approaches to the ankle x-ray. 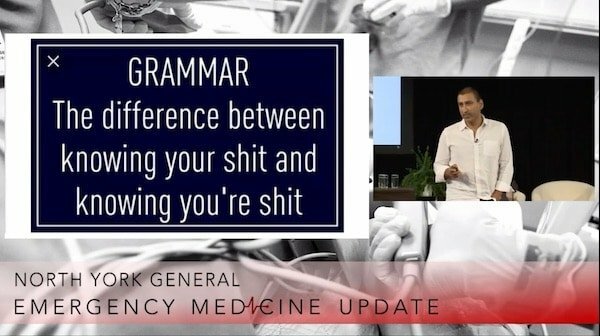 Here is an excellent EM focused summary. Remember that the ankle joint is very sensitive to even the slightest deviation. A shift of even 1mm can result in disruption of the ankle mechanics with downstream arthritis and gait disturbance. Ensure a mortise view in addition to the standard AP and lateral views. Talar shift: look to make sure there is congruence between the clear space on either side of the talus; measure the medial clear space and the lateral clear space. If they are incongruent or the medial clear space is >4mm the ankle is likely unstable. Talar tilt: The lines in red below should be parallel. 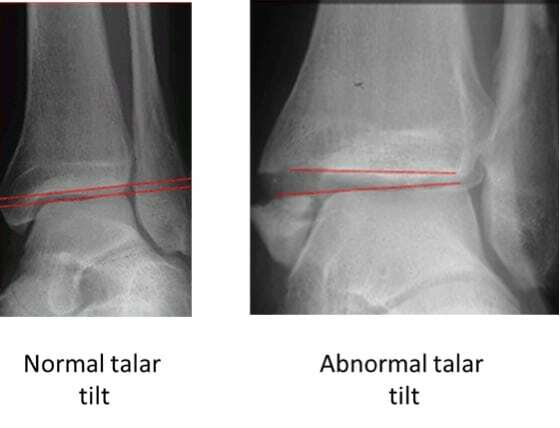 Talar tilt indicates an unstable ankle. 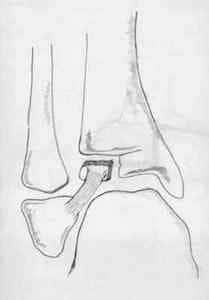 Tibio-fibular clear-space: Measure the gap between the tibia and fibula 1cm proximal to the tibial plafond on both the AP view and mortise view. They should be <6mm. If >6mm, suspect a syndesmosis injury. A Weber B fracture is an oblique lateral malleolus fracture at the level of the talar dome. While Weber B fractures associated with any suspicion for medial or deltoid ligament injury should be made non-weight bearing in a back slab, there are two ED management options for isolated Weber B fractures without any suspicion for medial involvement. Place the patient in a foam boot without crutches (have them weight bearing as tolerated) and have them follow up in a week in the orthopedic clinic. At that time they’ll “declare themselves” as either remaining stable (so you’ve saved them having to be completely immobilized) or they’ll shift on weight-bearing views and become unstable requiring surgery. Just be sure to warn them that this might happen. Note that in our experts’ opinion, ultrasound does not play a role in assessing the integrity of the deltoid ligament in the ED to help make decisions about the stability of Weber B fractures. Ligaments of the ankle. Note the location of the distal tibiofibular syndesmosis. A high ankle sprain is an isolated distal tibiofibular syndesmosis injury (not a severe lateral ankle sprain). They are missed in 20% of ED cases. 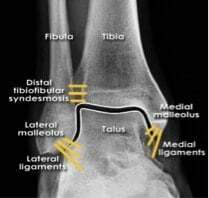 The syndesmosis ligaments stabilize the ankle mortise so that an injury to the syndesmosis may result in an unstable ankle injury. Any patient who refuses to weight bear, with anterior ankle pain, and a mechanism of external rotation with ankle dorsiflexion should be considered to have a syndesmosis injury until proven otherwise. Consider this injury in sports where players wear a boot (eg. hockey, snowboarding, etc.) that generally prevents typical lateral ankle sprains. Toe walking to prevent painful dorsiflexion. Squeeze tibia/fibula together at mid-calf level and assess for pain at syndesmosis distally near the talus. Stabilize the leg with the hip and knee flexed to 90 degrees. Holding the patient’s foot and externally rotating it with a small amount of dorsiflexion will elicit pain at the syndesmosis. Why is it important to pick up a syndesmosis injury clinically? 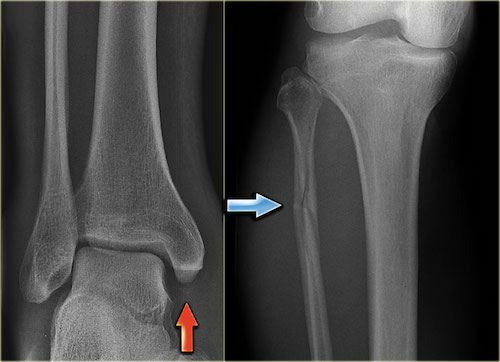 A Tillaux fracture is an intra-articular Salter-Harris class III fracture of the distal tibia with avulsion of the anterolateral tibial epiphysis. Tillaux fractures occur in children whose growth plates are not fully closed (ages 11-15). Remember that in children, the ligaments tend to be stronger than the growth plate. Tillaux fractures can be considered “the syndesmosis injury of children” because the clinical presentation is similar. As in syndesmosis injuries, be concerned in the patient who is refusing to weight bear, with anterior ankle pain, and the mechanism was external rotation. Tillaux fractures often occur as a result of a low energy mechanism. Maisonneuve and Dupuytren’s fractures are Weber C spiral fractures of the proximal third and middle third of the fibula respectively. Medial ankle injury with medial clear space widening associated with Masonneuve fracture. Again, the mechanism of injury for these fractures is external rotation of the ankle. These fractures are commonly missed 2nd fractures, and this is why your ankle exam starts at the proximal fibula and includes the entire length of the fibula. Possible associated injuries include a medial malleolus fracture, deltoid ligament rupture, syndesmosis injury or posterior malleolus fracture. Be suspicious of a fibula fracture if the medial clear space is > 4 mm. The fibula may not be tender. Either way, consider a full tib-fib x-ray to rule out a Masonneuve or Dupuytern’s fracure for all patients with suspected medial ankle injuries. Pearl: For all medial ankle injuries consider tib-fib x-rays to rule out an associated fibula fracture, regardless of whether or not the patient is tender along the fibula. Both Maisonneuve and Dupuytren’s injuries are unstable injuries and require the patient to have a splint, be non-weight-bearing, and see an orthopedic surgeon. Immobilization in a below-knee posterior slab and crutches is acceptable according to our experts. The most commonly missed fracture is the 2nd fracture. A snowboarder’s fracture is a lateral process of talus fracture that is commonly misdiagnosed as a simple ankle sprain. Yet again, the mechanism of injury is external rotation of the ankle usually associated with dorsiflexion and an axial load upon landing. 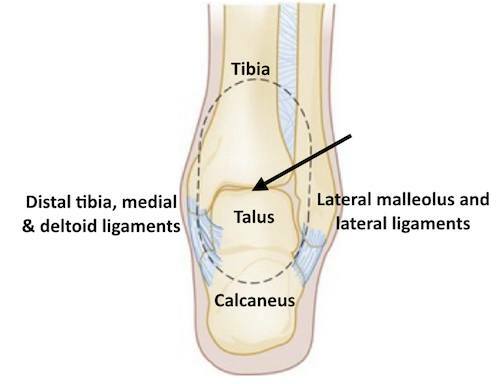 The talus is an often overlooked bone on physical exam. Just as we are trained to assess the scaphoid bone for occult fracture for all wrist injuries we should assess the talus bone for occult fracture for all ankle injuries. Get a good mortise view of your ankle to pick up this fracture, which can be very subtle or occult on x-ray. If in doubt on your x-ray, place the patient in a posterior slab, non-weight-bearing and have them follow in up fracture clinic. If available, get a CT ankle. The talus is the “scaphoid bone of the ankle”. Make sure to always assess the talus on physical exam of the ankle. Eversion/External rotation mechanism = red flag for syndesmosis, talus, tillaux, deltoid, Maisonneuve and Dupuytren’s injuries that may require surgery. The Ottawa Ankle Rules should not be used a guide for your physical exam of a patient with an ankle injury. Anterior ankle pain/tenderness should raise the possibility of a syndesmosis high ankle sprain injury or tillaux fracture. Always examine the medial ankle to assess not only for medial malleolus but also for deltoid ligament injuries. If any medial tenderness, examine the entire fibula for a Maisonneuve or Dupuytren’s fracture and order a tib-fib x-ray. The talus is the “scaphoid bone of the ankle”. Make sure to always assess the talus on physical exam of the ankle. If the x-ray is not giving an answer, a CT is a reasonable next step. Kalyani BS, Roberts CS, Giannoudis PV. The Maisonneuve injury: a comprehensive review. Orthopedics. 2010;33(3):196-7. Kelly AM, Richards D, Kerr L, et al. Failed validation of a clinical decision rule for the use of radiography in acute ankle injury. N Z Med J. 1994;107(982):294-5. Stufkens SA, Van den bekerom MP, Knupp M, Hintermann B, Van dijk CN. The diagnosis and treatment of deltoid ligament lesions in supination-external rotation ankle fractures: a review. Strategies Trauma Limb Reconstr. 2012;7(2):73-85. Taweel NR, Raikin SM, Karanjia HN, Ahmad J. The proximal fibula should be examined in all patients with ankle injury: a case series of missed maisonneuve fractures. J Emerg Med. 2013;44(2):e251-5. 1. Which of the following is NOT a helpful tip for distinguishing a lateral ankle sprain or fracture from a more sinister injury? Do not limit your assessment to where the Ottawa Ankle Rule guide you. Assessing other areas of the ankle will help you avoid missing other important injuries. 2. Which of the following structures does not make up the ring of bone and ligaments in the Closed Ring Classification System? In the Closed Ring Classification system, the ankle is thought of as a ring of bone and ligaments surrounding the talus. This ring consist of the tibia, the medial malleolus and medial deltoid ligaments, the fibula and lateral ligaments and calcaneus. 3. Which of the following ankle x-ray findings suggest ankle instability? 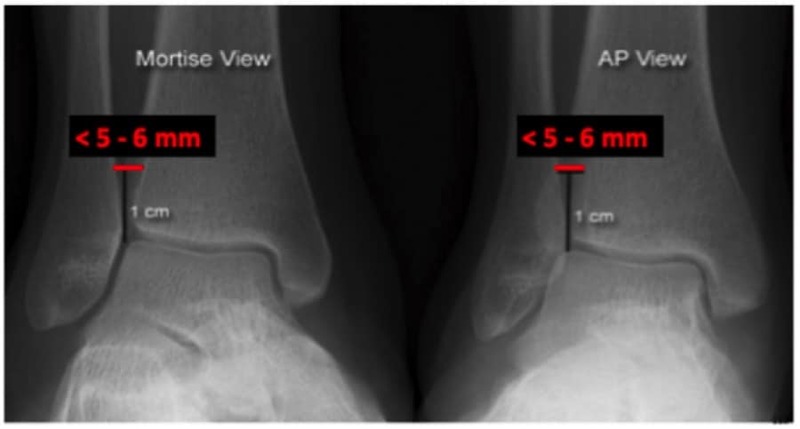 In assessing the ankle x-ray, the lateral and medial clear space should be equal to or less than 4mm. The tibio-fibular clear-space should be <6mm on both the AP and mortise views. 4. A 25 year old man presents after suffering an injury at a hockey game. He is unsure of the mechanism of his injury but is complaining of anterior ankle pain. He is unable to bear weight and has a positive squeeze and external rotation test on exam. What injury are you most suspicious of? A high ankle sprain is an isolated distal tibiofibular syndesmosis injury. Patients with this injury tent to present with anterior ankle pain, refuse to weight bear, and have a mechanism of external rotation with ankle dorsiflexion. On exam, they tend to have toe walking to prevent painful dorsiflexion, positive squeeze test, and positive external rotation test. 5. 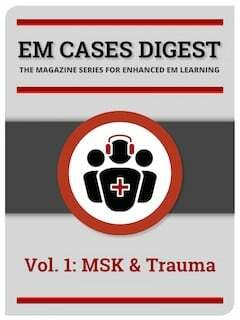 In the ED, how would you manage a patient with a Weber B fracture in whom you are suspicious for an associated deltoid ligament injury? In any Weber B fracture associated with a suspicion for medial or deltoid ligament injury, place the patient in a back slab, make them non-weight bearing, and arrange for orthopedic follow up. In those without any suspicion for medial involvement, both C and D would be acceptable. There is little, if any, role for POCUS in assessing the integrity of the deltoid ligament in the ED. 6. A 23-year old female sustains an ankle injury. When the impact occurred, her foot was placed in external rotation, and then she landed in dorsiflexion with an axial load. 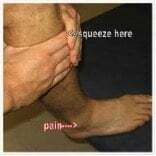 There is no pain on palpation of the fibula. What injury are you most worried about? 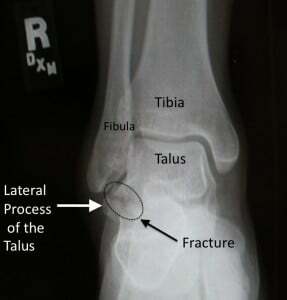 The Snowboarder’s fracture is a fracture of the lateral process of the talus. It is commonly misdiagnosed as a simple ankle sprain. Mechanism of injury is external rotation of the ankle, usually associated with dorsiflexion and an axial load upon landing. Get a good mortise view of the ankle. If in doubt, place patient in a posterior slab, non-weight bearing, and have them follow up in fracture clinic. If available, get a CT ankle. 7. Which of the following on history-taking make you suspect something more than just a simple ankle sprain? 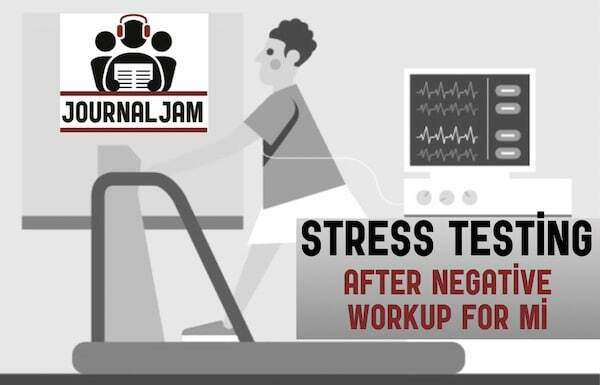 Non-weight bearing and external rotation injuries are red flags for something more sinister. 8. A 30 year old male presents to the emergency department after suffering an external rotation injury during Rugby. He is complaining of pain on palpation of the medial malleolus and the fibula. Which ankle injury are you MOST worried about? For all medial ankle injuries, consider performing a full tib-fib X-ray to rule out a Masonneuve or Dupuytern’s fracture. These fractures are unstable injuries and requires further management. 9. You are seeing a 20 year old female in the emergency department for right ankle pain. 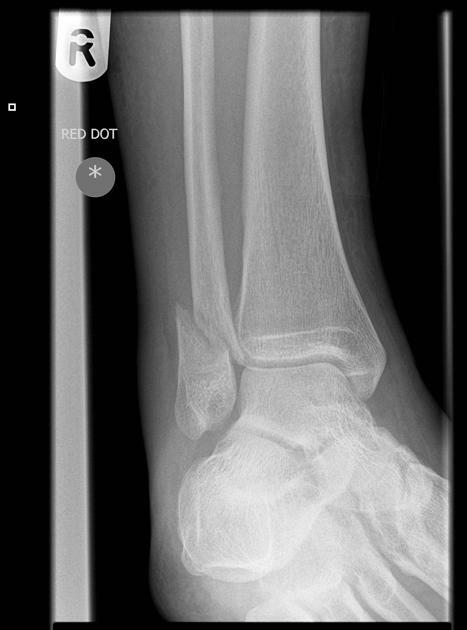 On her X-ray, you see a medial clear space of 6mm and a proximal fibula fracture. What would you do next to manage this patient’s injury? This patient likely has a Masonneuve’s fracture. This can be treated with a below-knee posterior slab. The patient should be given crutches and made non-weight bearing until they are assessed by an orthopedic surgeon. 10. In the Closed Ring Classification System of the ankle, a single disruption in the ring allows stability to be preserved while two disruptions will likely cause the joint to shift. Which single disruption is an exception to this rule and can still cause instability? The two exceptions to this system are the isolated syndesmosis injury, and the lateral malleolus fracture. Despite causing only one disruption in the ring, these injuries can still cause instability and shift in the joint.